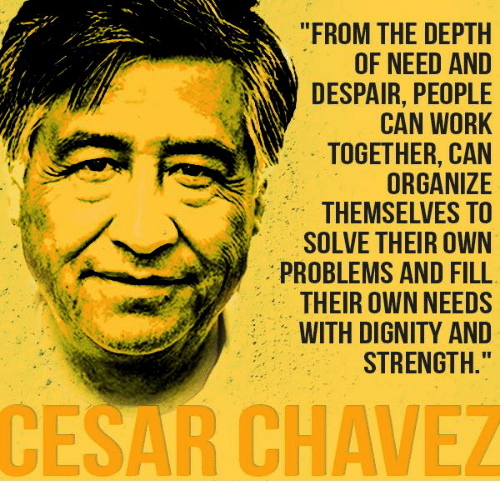 EDITOR’S NOTE: Cesar Chavez ( 1927-1993) was an American labor leader and nonviolence civil rights activist who, with Dolores Huerta, co-founded the National Farm Workers Association (later the United Farm Workers union, UFW). A Mexican-American farm worker, Chavez became the best known Latino-American civil rights activist. His “militant nonviolence”, as he referred to it, made the farm workers’ struggle a moral cause with nationwide support. By the late 1970s, his tactics had forced growers to recognize the UFW as the bargaining agent for 50,000 field workers in California and Florida. See also our article on Danilo Dolci and Cesar Chavez posted here. John Dear is a regular contributor to this site. Please click on his byline for further biographical information and an index of his articles posted here, or go to our Author Archives page here.